Are you without a date this Valentines? With OPPO’s #HaveYouEver promo, expressing your hugot story could win you some prizes. If you’re without a date this Valentine’s day, then maybe you can turn that heartache into prizes. With OPPO’s #HaveYouEver promo, you can turn your best hugot stories into SM Gift Certificates. 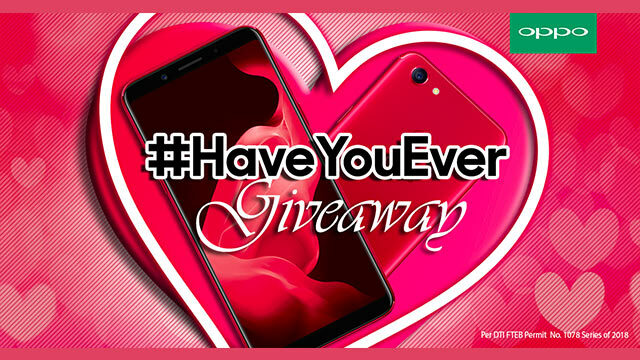 OPPO will be posting a different #HaveYouEver question on their Facebook page at 2PM everyday. To join, participants must answer by sharing their story through a video submission. You should be able share your heartache story and also relay what you learned from it. The promo runs from February 1 until February 14. Those with the best hugot stories can win Php25,000 worth of SM Gift Certificates. You may visit facebook.com/OPPOPH for more details. Here is the complete mechanics, for those interested to join. To join the promo, the participants must visit https://web.facebook.com/pg/OPPOPH/#HaveYouEverGiveaway/?ref=page_internal and register their full name, email address, registered address, contact number, and submit a video to the #HaveYouEver question for the day by telling his/her story (file size: maximum of 100MB (5 minutes); file format: mp4) to get (1) one raffle entry. A #HaveYouEver question will be posted every day at 2PM from February 1, 2018 until February 14, 2018. A participant can submit a video answering the question of the day within 24 hours until another question is posted. It is not required of the participants to submit an entry for every #HaveYouEver question. However, in order to get more raffle entries, participants are encouraged to answer each question and tell his/her #HaveYouEver story which is equivalent to (1) one raffle entry. Each question can only be accomplished once per account. A participant can only obtain a maximum of 14 entries for the whole promo period. Deadline of submission of entries is on February 14, 2018 at 11:59 PM. There will be three (3) winners of Php 25,000 worth of SM gift certificates. The winners will be drawn using http://www.random.org. The draw for the prizes will be held on February 15, 2018, 5PM at 6/F Viva Communications Inc. East Tower Philippine Stock Exchange Center, Exchange Road, Ortigas Center, Pasig City in the presence of a DTI representative and authorized representatives of Viva Communications Inc. The announcement of winners will be done via Facebook post on February 16, 2018. Registered mail will also be sent to the winners. Twenty percent (20%) tax for the prize exceeding PHP10,000 shall be shouldered by the Philippine OPPO Mobile Technology Inc. Winners can claim their prizes from the OPPO Concept Store nearest to them. They must present at least one (1) valid ID and the registered notice for verification upon claiming. The winners must present a valid ID which contains the same information as his/her registered details. If the participant cannot claim his/her prize, the one who will claim the prize on his/her behalf must present an authorization letter, a photocopy of his/her ID and a photocopy of the winner’s ID. The winners can claim their prizes until 60 days after they receive their registered mail.